What to do when waiting on new yarn to finish a blanket…… start another blanket! While red and pink may not be everyones cup of tea, I am really enjoying it. I chose a granny square blanket because I like the look but mainly because I don’t have to give it any thought while I am making it. The only real thought that went into it were the colours and the combination to use, which took about five minutes. 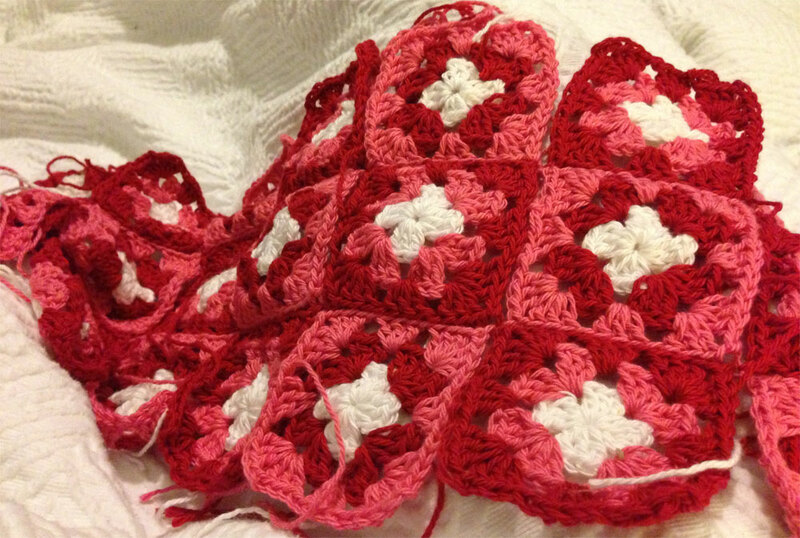 I went with uniform colour in the middle (white) and alternating the other two rows. The simplicity has been such a nice change from Mr. Stripes, I still question the stitches and colours for that one. It must be the difference between using a tried and tested pattern and going out in the wilderness with a new style (which has every chance of failing!). Anyway, now that I am three rows in, can you guess what has happened? That right, I am running out of yarn for this blanket now. This is working out to be an expensive venture! A new order will have to wait until I have saved some more coins. In the mean time I have a rather large job to do, weave in ALL those ends. It looks like that will take longer then making the squares themselves. Colour: (I think) Snow, Blush and Pomegranate (Will find out once I make the order). Stitch: 3 x Doubles, chain 1. Corners are Chain two. Joining: Blush (Pink), Slip stitching on the reverse side. This entry was posted in Blankets, Crochet and tagged Bendigo Woollen Mills, blanket, Cotton, crochet, Crochet Missy, square, Strawberries and Cream. Bookmark the permalink. Thank you. It is good to see that you are still around, I check up on your blog every now and then to see if you have posted. I really do like those coasters. It really works and on paper I’d wince without more balancing colours, very nice. Thank you. I am thinking of unravelling Mr Stripes and doing him in Wool instead. Same colours though. Just for something different. The larger it gets the more I like it. I am four rows in at the moment. As for warmth, it is only cotton so it is not going to be very snuggly but I am sure that I can find lots of uses for it.